Love Onix. My favorite pokemon. Wondering what how Ditto and Porygon would work. Cubone is probably already morbid enough without adding your touch to it I'm sure. The description sounds exactly like that of the cave troll from your first book? I would have preferred to see the ones that you started and only have W.I.P of finished instead of a whole new pokemon. Onix have a secondary brain too? COOL! 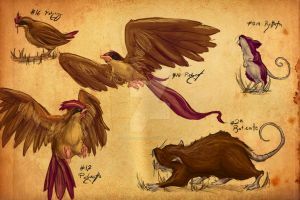 I love your Pokemon Anatomy-Pokedex. But ... Shipping (U.S. only) ? You don't ship to Germany??? Wait, what's the difference between hardness and resilience? Heh, thanks for the physics lesson. Yay more text with the drawings. I thought you had stopped doing that.